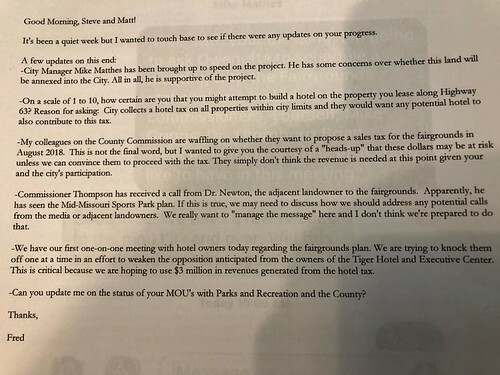 "Various ways to fleece taxpayers"
COLUMBIA, Mo 4/10/18 (Beat Byte) -- A Boone County Commissioner's email about a plan to divert City of Columbia park tax dollars to the shuttered County Fairgrounds is an eye-opening look at backroom scheming to raise taxes and elbow out opposition. "We really want to manage the message here," Southern District Commissioner Fred Parry (R) told Matt Thornburg and another person he addressed as "Steve." The message: convince Columbia City Council members to help fund a Fairgrounds project with sales taxes voters approved for A. Perry Phillips Park in south Columbia. Jac Cardetti, a lobbyist for the Odle family of developers, posted the Commissioner's email on the Columbia Heart Beat Facebook page last month. The Odles are building a mixed-use hotel, office, and apartment center next to Phillips Park. "Here’s an email from Fred about the various ways to fleece taxpayers on this backroom deal," Cardetti wrote. New hotel taxes and a second swing at a Fairgrounds tax were also part of Parry's plan. Click photo for larger version. Parry -- a longtime Republican who has for decades claimed to be fiscally conservative -- did not respond to requests for comment. Also known as the Central Missouri Events Center, the Fairgrounds has a history of failure. County government bought it in 1999 for $2.6 million from the bankrupt Boone County Agricultural and Mechanical Society (BCAMS). The sale paid off a loan to BCAMS from prominent area developer Billy Sapp. Thornburg, a Columbia orthopedic surgeon, proposed a private partnership with the city and county to build a "sports park" at the Fairgrounds. Parry's message management circumvented other elected officials. Columbia city manager Mike Matthes, a non-elected City Council appointee, "has been brought up to speed" and supports the project, Parry explained in the email. To entice Matthes, Parry tried to sell Thornburg's plan as another way to collect hotel taxes. "How certain are you that you might attempt to build a hotel?" he asked Thornburg. "The city collects a hotel tax." Another tax plan Parry favored: revisiting a sales tax that failed at the polls in 2014. First stop: convincing fellow Commissioners Dan Atwill and Janet Thompson, both Democrats, to put it back on the ballot. "My colleagues on the County Commission are waffling on whether they want to propose a sales tax for the Fairgrounds in August 2018," he explained. "Dollars may be at risk unless we can convince them to proceed with the sales tax. They simply don't think the revenue is needed at this point." 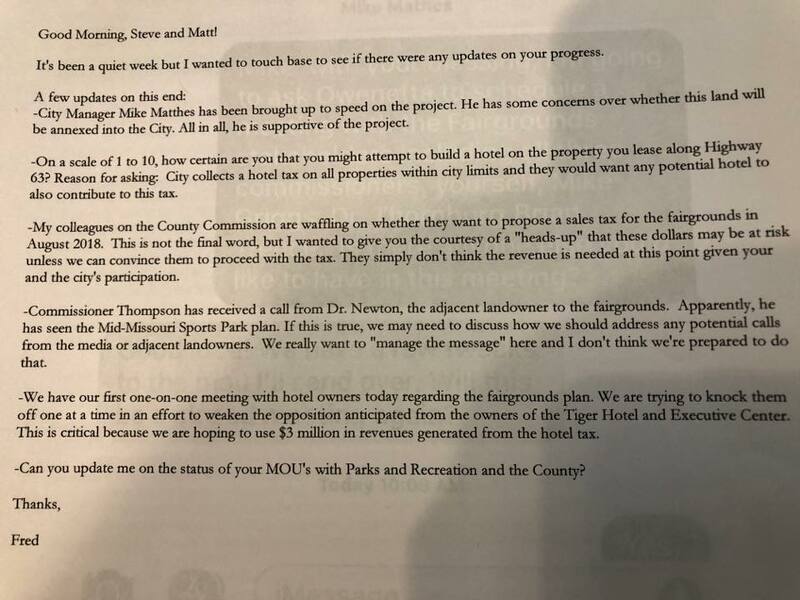 Other hotel owners could threaten the Fairgrounds plan too, Parry wrote, since Thornburg and Co. would be muscling in on hotel tax revenue the city uses to recruit tourists and fund events. "We are trying to knock them off one at a time, to weaken opposition anticipated from the owners of the Tiger Hotel and the Holiday Inn Executive Center," Glyn Laverick and Ed and Kathy Baker, respectively. "This is critical because we are hoping to use $3 million in revenues generated from the hotel tax." Columbia City Council members voted down the proposed partnership with Boone County last month, staying with the original Phillips Park plan.